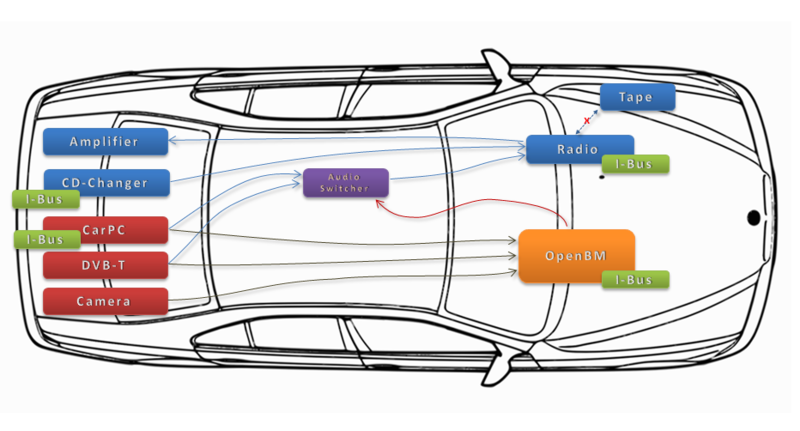 OpenBM acts as input/output for the CarPC. Both, CarPC and OpenBM, will leave on the IBus. Message sent from OpenBM and other BMW Equipment will be received by the CarPC and according output will be generated on the display. Additionally OpenBM is capable of switching audio sources and video sources. As video sources the CarPC, DVB-T/DVD and rearview Camera are used. As audio sources there is the original CD-Changer, Radio and the output of the audio switcher (i.e. CarPC or DVB-T). Here a short scheme showing the overall concept of CarPC installation.